This is the Anti Election. Brazil is at the Crossroads. “When Fascism came into power, most people were unprepared, both theoretically and practically. They were unable to believe that man could exhibit such propensities for evil, such lust for power, such disregard for the rights of the weak, or such yearning for submission. Brazil’s elections are for the President, Vice President and the National Congress. Elections for state Governors and Vice Governors, state Legislative Assemblies and Federal District Legislative Chamber are held at the same time. The first round had no outright presidential winner so will lead to a run off in two weeks time and this has already led to many family fights and much grief among friends and colleagues. The polorization is intense. Violence against the left is rising with over 50 incidents reported in the last week including the murder of a 62 year old Capoeira Maestre. On the Right is the racist, mysogonistic, homofobic torture admiring Bolsonazi and his family and to the Left is the tainted PT who with their leader Lula in jail is now headed by Haddad the ex mayor of São Paulo, but apart from that relatively unknown. Centre left and trailing by a wide margin was probably the most sensible of the lot, Ciro Gomes. Unsettling times. Dangerous times and ripe for exploitation by the unscrupulous. Foreign Policy magazine consideres that Jair Bolsonaro’s Model Isn’t Berlusconi. It’s Goebbels. The far-right Brazilian leader isn’t just another conservative populist. His propaganda campaign has taken a page straight from the Nazi playbook. Vincent Bevins; acclaimed and respected journalist has extensively researched Jair Bolsonaro. Brazil has been a democracy with direct presidential elections since 1989, but for the preceding quarter-century it was ruled by a brutal military government. Bolsonaro is not merely nostalgic for that era; he would reintroduce the dictatorship’s political ethos, preserved and intact, into modern Brazil. Cross out America and put in Brazil – Edir Macedo, Evangelist bishop and owner of the communications empire Rede Record who has put his resources firmly behind the Bolsonazi. Jair Bolsonaro is the monstrous product of the country’s silence about the crimes committed by its former dictatorship. Ernest Hemingway sums up the feeling of many who must now hold their noses and vote for Haddad to keep the fascists at bay. or in todays mode “I do not fight fascists because I will win. I fight fascists because they are fascists.” – (Chris Hedges, Wages of Rebellion: The Moral Imperative of Revolt). 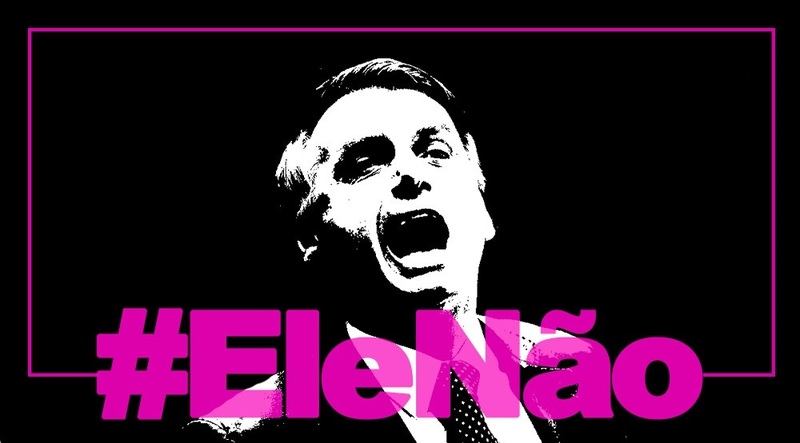 The election is being fought on Social media as Bolsonario will not debate his opponent due to “Medical Restrictions”. The abrupt forceful rise of the far right shows the complete disaffection of the populace with the venal self serving and often criminal politicians of the past. The question is will this election solve any of that or lead to more of the same but with fascist inclinations. As noted above violence against leftists is rising and I wonder if we are due a major incident. Terror and assassination and mysterious accidents are far from unknown in Brazilian political life. The Generals are no longer in the background. Gen. Antônio Hamilton Mourão is running as the vice president. and now after the first round are showing their true colours…..and then there are the Milicias who will feel that they are being given free rein should Bolsonario win. “The army will take its own decisions”, not bow to Mr Bolsonaro, he says. Indeed, if Mr Bolsonaro wins, its resistance to complete civilian control may prove to be a restraint on him. The army would feel forced to intervene, Mr Valladão adds, only if Brazil slid into large-scale political violence“”. Which once more sets the scene for false flag destabiliazation events. The keystone of the Fascist doctrine is its conception of the State, of its essence, its functions, and its aims. 2018.11.04 Edited to remove an untruth. « So, why do I live in Rio de Janeiro?